How Do You Move A Bookstore? With A Human Chain, Book By Book Shoulder to shoulder, they formed a line 500 feet long: from the stockroom of the old shop, down the sidewalk, and onto the shop floor of the new store. 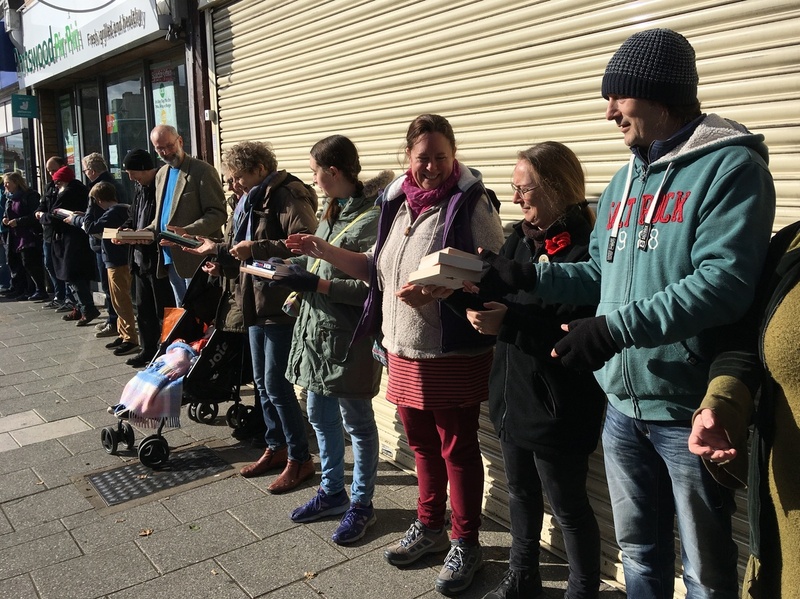 People pass books down a chain to help the bookstore October Books move to a new location on Sunday in Southampton, England. As they prepared to "lift and shift" on Sunday, they expected perhaps 100 people to help. 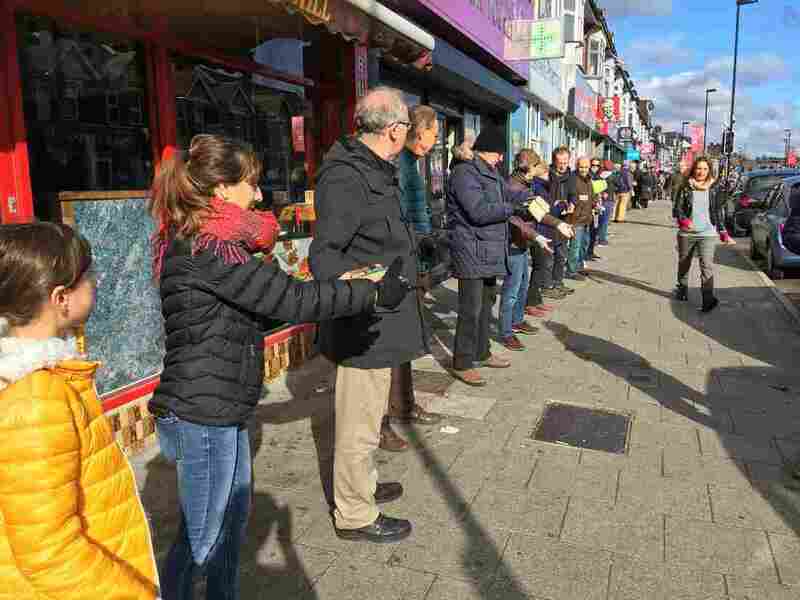 "But on the day, we had over 200 people turn out, which was a sight to behold," Amy Brown, one of the shop's five part-time staff members, told NPR. Community members moved more than 2,000 books in an hour. When the great bookchain began, she was in the stockroom. "I was handing books to people without actually seeing the entire of it. So it was only after about 20 minutes I actually go out into the road and saw the extent of the people," she said. October Books, founded in 1977, calls itself "more than a bookshop." It sells political and current affairs books, fiction and children's books, and and some food and fair-trade products. But as it struggled to pay rising rents, it had launched a campaign over the summer to raise $400,000 to buy a space of its own: an old bank building. And raise it they did, through donations, crowdfunding, and people who donated money as "loanstock" — the shop will repay them the money that they've lent after one, five, or 10 years depending the loan terms. "There's been people who've been visiting us and buying books from us for 40 years" as the store has moved around the city numerous times, Brown said. "So a lot of people feel quite invested in it as a thing." 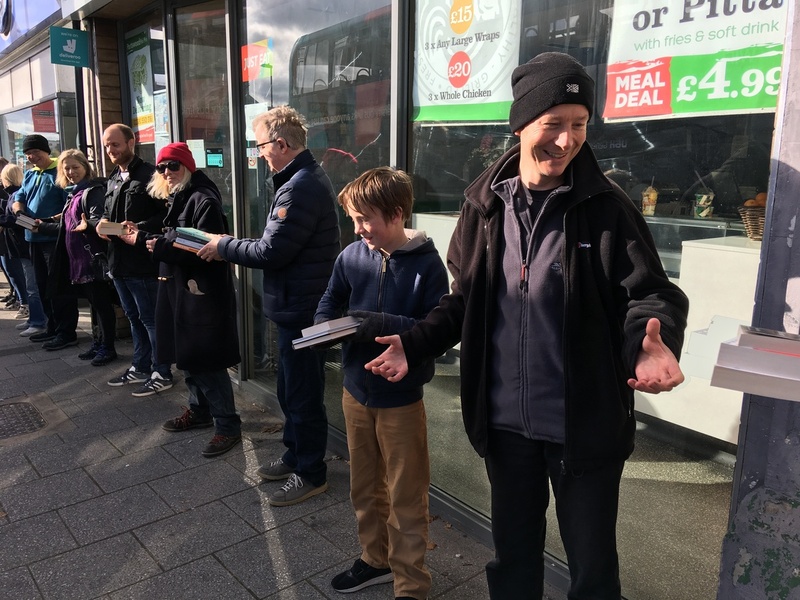 And in just one hour on Sunday, the community passed more than 2,000 books, hand to hand, to the new shop. "It was really sort of surprising and positive, and just a really moving experience to see people chipping in because they wanted to help. And they wanted to be part of something bigger," Brown said. The bookshop will reopen in its new home, a former bank building, on Saturday. Meanwhile, the bookshop's new location is being painted and built out. And Brown says she currently is surrounded by boxes and bits of broken-up furniture. There's a lot to get ready for the shop's next chapter. The new, permanent location of October Books has its grand opening on Saturday.